Enjoying your home is not just about what is on the inside (though that is very important), but the outside of your home as well. Having a beautiful outdoor living space is an excellent way to enjoy your home and increase its value. Deck construction is one great way to update your outdoor living space. It gives your home an entirely new look and expands the area in which you are able to enjoy leisure activities. A beautiful deck space has many useful functions. It can be the setting for an ideal barbeque, providing a space to cook outdoors and enjoy a meal in the open air. You can also use a deck as an outdoor lounge area, or simply as a way to enjoy outdoor views. As you consider ways to update your home, consider deck construction as an important option. There are many options you can consider when it comes to deck design, materials, and construction. Decks are a versatile way to increase the quality of your outdoor living space, and custom deck construction allows you to pick the perfect look for your home. Customizing your deck space is an important feature to make sure the deck is the right fit for your home. You should consider options that allow you to match the style of your home, and features that are in line with your home decoration likes as well as your utilitarian needs. 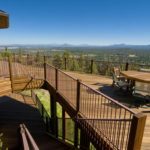 Are you curious about options for deck construction? Contact us to learn more about deck building options.